How to wear gold jeans. A pair of gold jeans is easily one of the raddest things you can have in your wardrobe, but we've noticed a lot of people shy away from them on the rack because of the old "how would I wear these?" conundrum. We think you'll be surprised just how versatile and easy to wear they really are. Everyone has a basic white or black top in their wardrobe, right? Tee, blouse, sweater, any of the above will work. From there what you want to add is up to you. High tops, booties, blazer, hoodie, it's all good. For the more adventurous out there, pair 'em with colour, print, and some badass gold accessories. 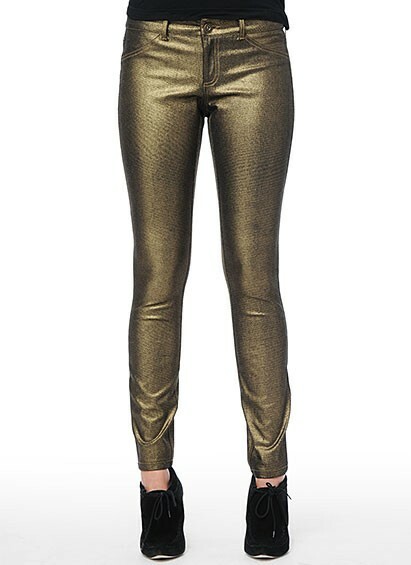 So by now you're probably thinking; "gold jeans are awesome, I need a pair in my life!" Lucky for you we still have a few of these BB Dakota beauties in stock, and they're ON SALE for $69!! What the what?! I'm wearing mine today with an ivory knit from One Teaspoon, this turban and a fur vest. And doing a little happy dance.